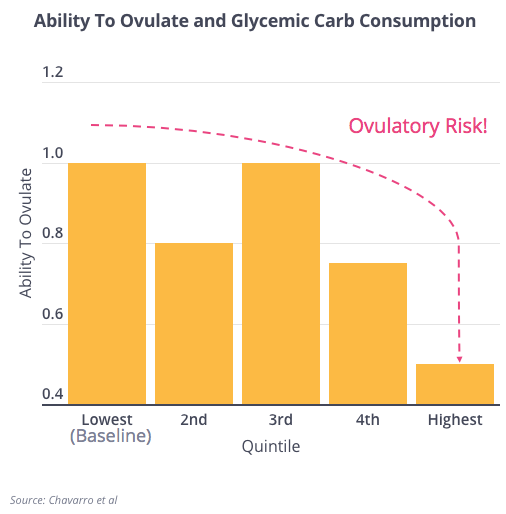 It’s easy to overgeneralize the role carbohydrate consumption can have on fertility and so here we need to be careful and refine how we categorize carbohydrates. 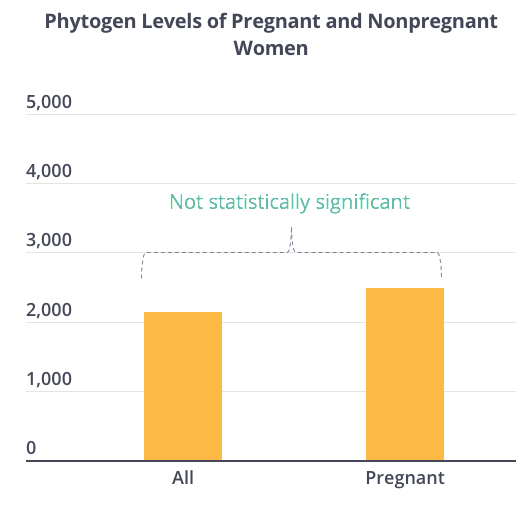 As you can see below in the Nurses Health Study, women who consumed carbohydrates with the highest glycemic index (like white rice and potatoes) were far more likely to suffer from anovulatory infertility than women who consumed carbohydrates with a low glycemic index (like whole grains, vegetables, and beans). When possible, you almost always want to trade off high for low glycemic carbohydrates. 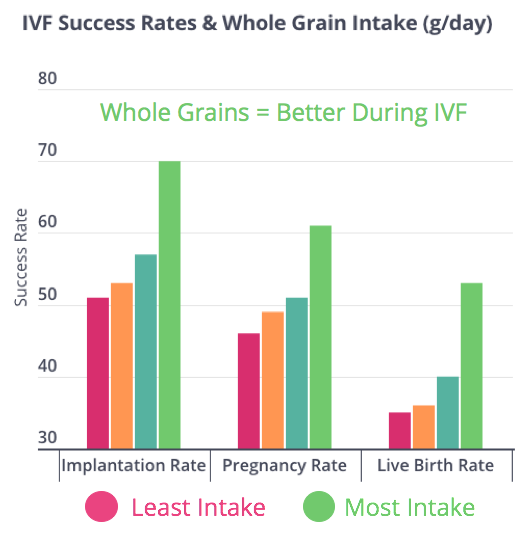 For women undergoing IVF, the data shows those who have higher whole grain consumption enjoy higher live birth rates after correcting for discrepancies in age, race, duration of infertility, and more. Below you can see the data from over 400 cycles performed at Harvard. While the study occurred in a single center, the gains made between the highest and lowest quartile are astonishing for their size and consistency. At the moment, the data on how red meat and white meat impact fertility is mixed, but on balance it is negative, especially in the case of processed red meat. 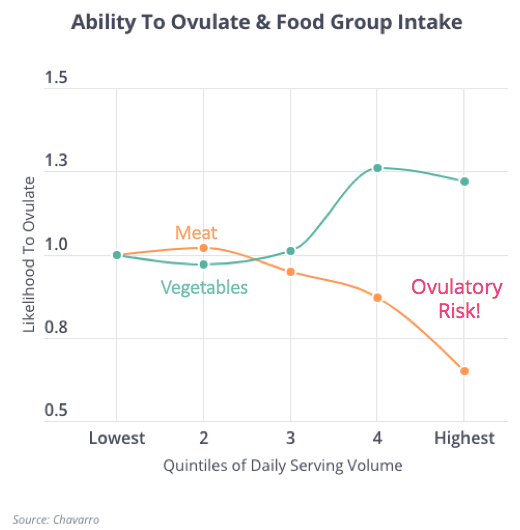 When Harvard investigators in charge of the Nurses Health Study (which we covered above) focused on diet patterns for women in their 30’s with no previous fertility issues, they noticed women in the highest meat consumption category were 40% more likely to have ovulatory dysfunction (if a woman cannot ovulate she cannot conceive naturally). One additional daily serving of meat translated into a 32% higher risk. As you can see below, the opposite was true with vegetable consumption. Unfortunately, the data we have on how meat intake impacts a woman’s ability to conceive through IVF is pretty paltry. 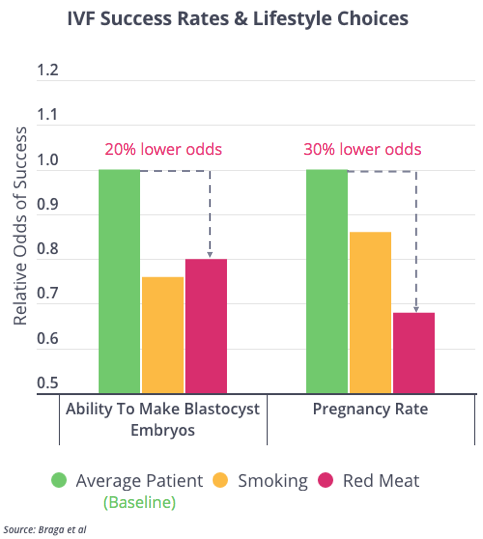 The best study we have comes from a single center (which is less preferable) in Brazil, and if it’s even close to accurate it paints a dim picture of red meat’s correlation to poorer IVF outcomes. As you can see below, red meat’s inverse correlation with ability to make quality embryos, and conceive, looks to be on par with smoking. For men, the better run studies seems to suggest consuming poultry is of little harm. On the other hand consuming processed red meats (like sausage or baloney) is more closely associated with issues than eating unprocessed red meats (like a piece of chicken or steak). If you’re trying to make the distinction, if you’re unable to trace a food back to a specific part of the animal, it’s likely processed and probably unhelpful. 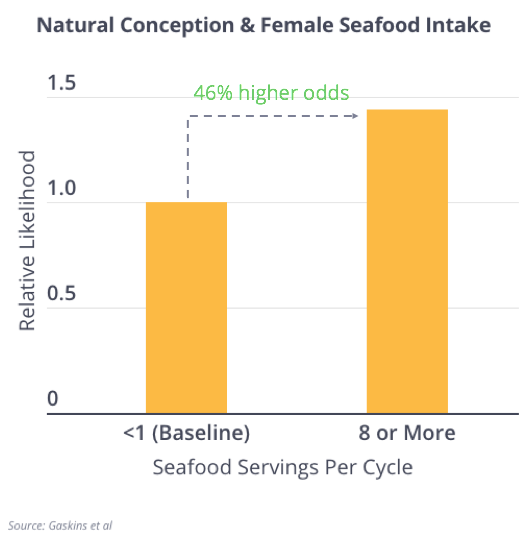 Amongst women trying to conceive naturally, greater seafood intake correlates with better fertility. Below is a study of 500 couples tracking their Time To Pregnancy based on seafood and fish consumption. Women who consumed more than 8 servings of seafood and fish per menstrual cycle enjoyed 40 - 60% greater likelihood of conceiving compared to women who hardly consumed it all. However, the greatest benefit was conferred when both members of a couple ate 8 or more servings per cycle. 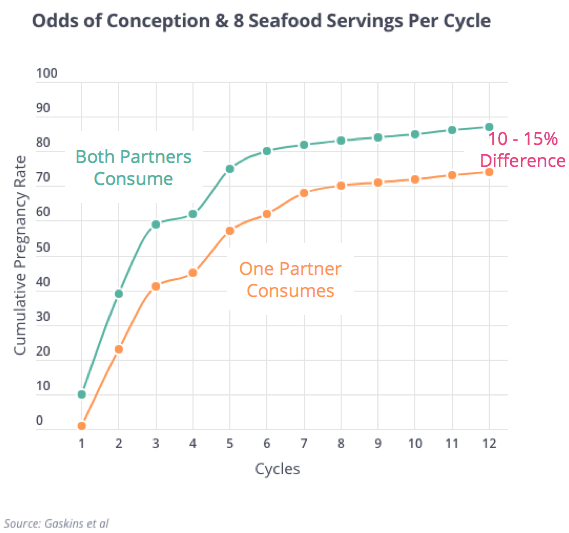 As you can see below, the cumulative odds of conception after each menstrual cycle is higher for the couples where both partners consume high levels of seafood and seafood rather than when just one partner does. All the same, some of the benefit of consuming seafood can be diminished if that seafood has been exposed to pollutants or mercury. As a result, where the seafood is caught, and what type it is, matters. A good illustration of this are two similar studies performed in Sweden (which has cleaner waters) and in the Lake Ontario region (more contaminated waters) that looked at local fish consumption and time to pregnancy. 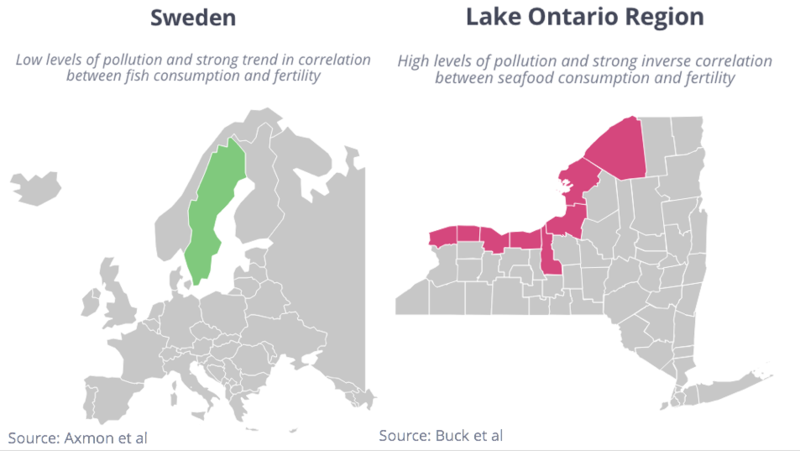 In Sweden, investigators saw an encouraging positive correlation between the two whereas in the Lake Ontario region investigators a 5 - 10% inverse correlation between local fish consumption and fertility. 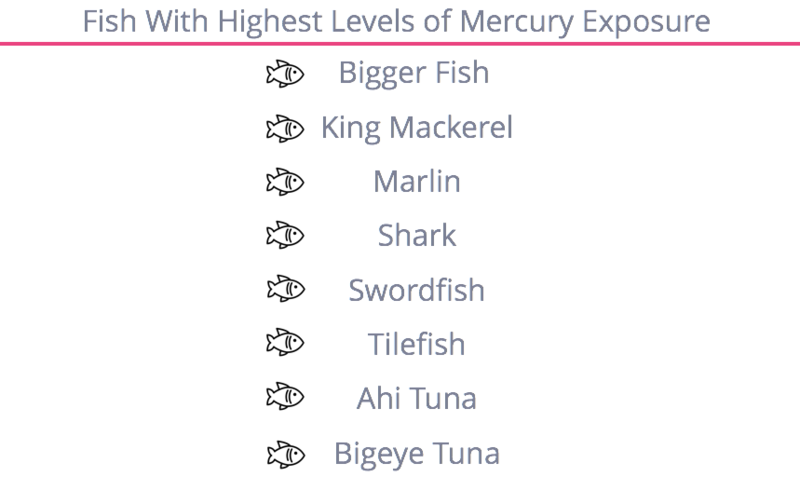 Today the American College of Obstetricians and Gynecologists recommends that women who are trying to conceive eat two to three servings of fish per week but limit their fish composed of high levels of mercury. Items like canned tuna are of moderate risk and should only be eaten once per week. Within an IVF population, the Brazilian study we referenced earlier noted that women who consumed greater levels of fish recorded higher levels of blastocyst embryos (embryos most likely to lead to a live birth), but that did not translate into a higher predicted rate of pregnancy. The data on the impact of dairy on fertility is contradictory. We have two good studies on the subject. The first, a pooled analysis of Dutch and American patients showed dairy consumption, by and large, had no impact on a woman’s time to pregnancy. In the second trial, when the investigators of the Nurses Health Study tracked women who had trouble conceiving due to ovulatory dysfunction, they noticed women with a high intake of high fat dairy were more likely to be able to ovulate and conceive than women with a high intake of low fat dairy. 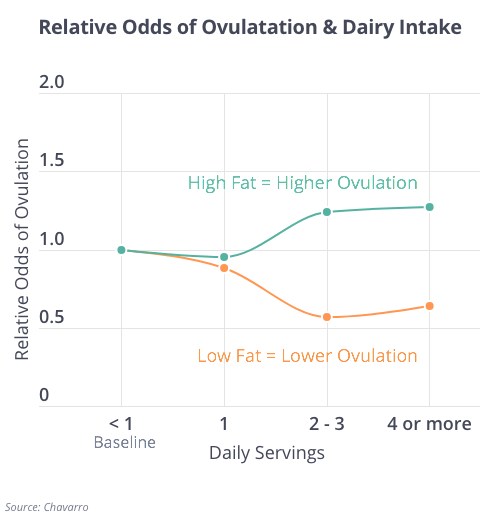 Specifically, whole milk appeared to be associated with better ovulation while low fat yogurt, frozen yogurt, and sherbert were associated with more ovulation issues. 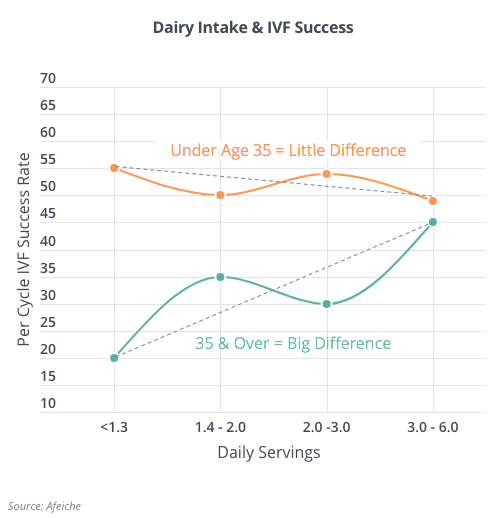 Amongst women undergoing IVF, the best study on the subject followed over 200 women and determined in women 35 and over higher daily dairy intake closely associated with increased rates of success, especially at rates of over 3 servings per day (amongst younger women it had no correlation to success). The finding surprised the team at Harvard doing the research and, as we alluded to above, it can be hard for us to determine whether this was “coincidence” or “causality” without adjusting behavior and seeing if fertility rates follow suit. Soy and its impact on fertility has been controversial for some time largely because in animals (like cows and cheetahs) soy intake has been closely correlated with infertility. Soy contains phytoestrogens that chemically look like estrogen, bind to estrogen receptors, and thus could impact a woman’s ability to produce estrogen and conceive. However, in humans the data pretty clearly demonstrates that soy intake in women does no harm when trying to conceive naturally and in high quantities, through supplements, is helpful when a woman must resort to ovulation induction, IUI or IVF. 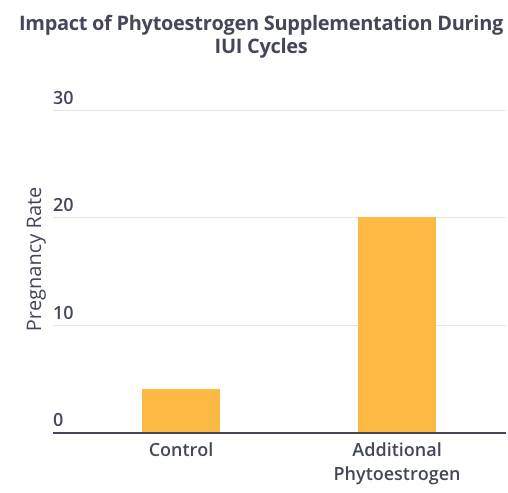 First, in women trying to conceive naturally, in a study of 500 women in Texas and Michigan, urinary phytogens (a recognized proxy for soy intake) had no correlation to the pregnancy rate after 12 months. At every rung of fertility treatment (ovulation induction with clomid, IUI, and IVF) soy has shown a benefit. Let’s take a look. Amongst 120 women taking clomid (an oral drug often used as first line treatment) with unexplained infertility, those that who were given an additional oral dose of phytoestrogen recorded greater endometrial thickness (the uterus’s walls must be thick enough for an embryo to implant successfully) and far higher pregnancy rates. A number of investigators believe the first relates to the second. 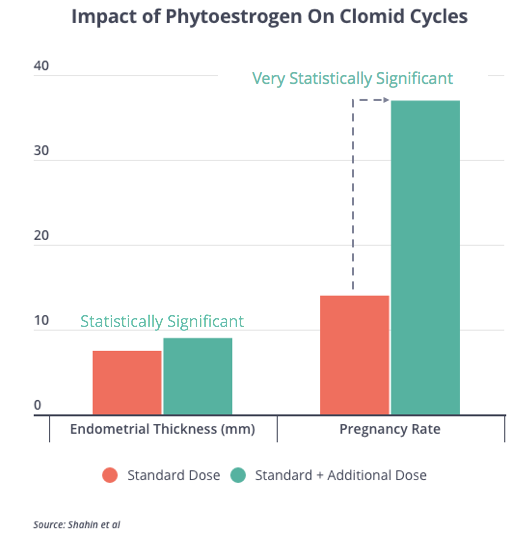 Clomid can have a negative impact on endometrial thickness and if phytoestrogens can help reverse that it might explain the higher pregnancy rates. Amongst women ages 25 - 35 with two years of anovulatory infertility and undergoing intrauterine insemination (called IUI, the process of injecting sperm into the uterus) in combination with clomid, those who also received phytoestrogen (1500 mg day for 10 days) also recorded higher rates of pregnancy. 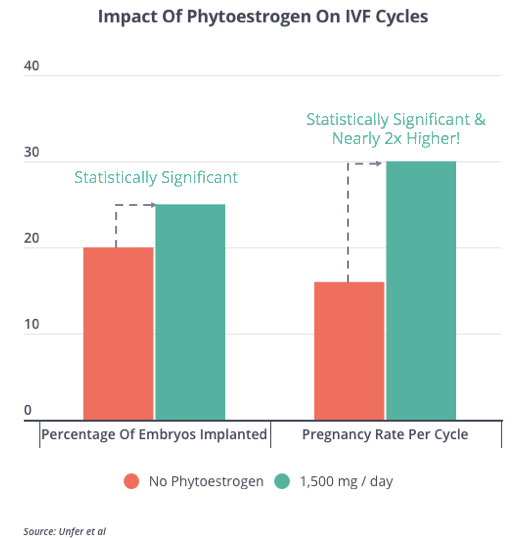 Finally, a prospective, randomized control trial of women undergoing IVF revealed that women who were given phytoestrogens immediately after the oocyte retrieval for a few days had higher ongoing pregnancy rates. 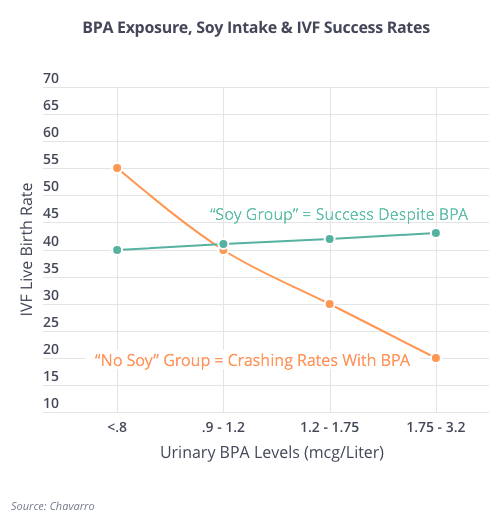 As for men, there is a fairly close association between soy consumption and lower sperm counts, but in both natural conception and IVF those changes aren’t large enough to impact success rates. As patients it’s probably best to not overthink fatty acids and to go with our instincts and how we’ve been educated on good nutrition in general. 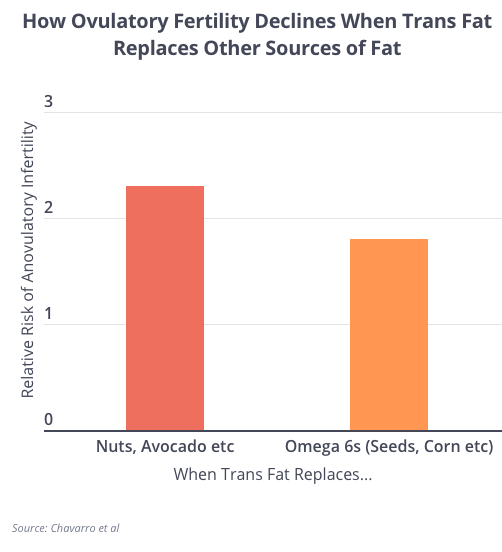 Trans fatty acids (found in snacks and fast food) are unhelpful and items like omega 3’s (found in fish, tofu, flax seeds, and spinach) are good. Let’s take a look. 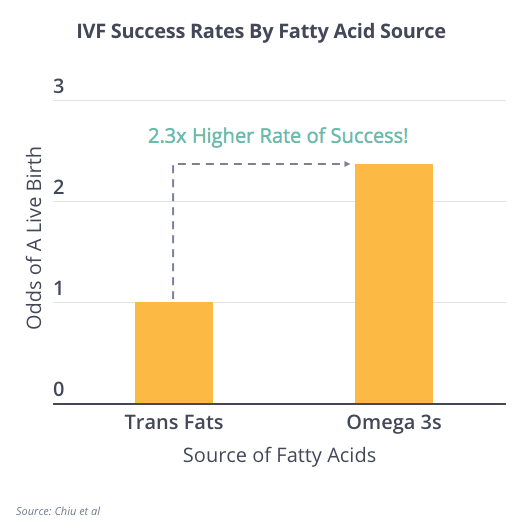 As you can see below in the Nurses Health Study, women who substituted trans fatty acids in their diet over other forms of fatty-acid energy (like nuts or avocado), were nearly twice as likely to suffer from ovulatory infertility. Conversely, intake of polyunsaturated fatty acids (known as PUFAs) and specifically those in the Omega 3 (like fish, tofu, spinach, beans) class appear to be incredibly helpful. In a small study done out of Harvard, patients those with higher rates of Omega 3 found in their blood levels had 2.37x higher higher odds of conceiving after IVF. The same is true for men, who seem to clearly benefit from an Omega 3 rich diet, whether those Omega 3s come from fish, walnuts, or another energy source. 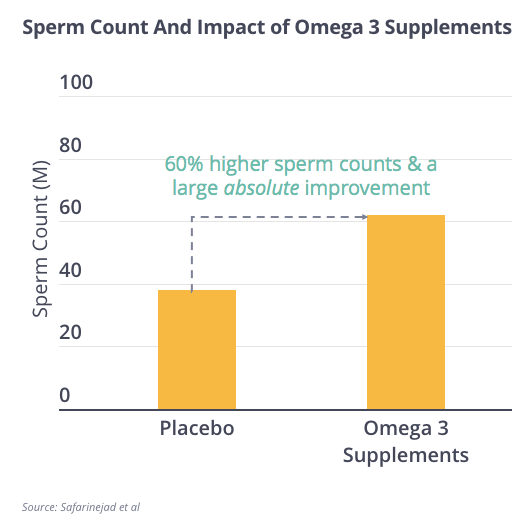 Amongst 211 men who were given either Omega 3 supplements for 32 weeks or a placebo, those who received supplementation recorded dramatically (both on a percentage and absolute basis) higher sperm counts.